The Fifth Joyful Mystery – Finding the Child Jesus in the Temple & Family Life! | ADULT CATECHESIS & CHRISTIAN RELIGIOUS LITERACY IN THE ROMAN CATHOLIC TRADITION: hosting ONLY True Christians!! !, or "How to think Catholic!!" The Fifth Joyful Mystery – Finding the Child Jesus in the Temple & Family Life! Recently, our dear friends Victoria & Dennis were married and paid me the deep compliment of having a noticeable role in their nuptials. I could not be more humbled and flattered. As a thank you, Victoria & Dennis sent Kelly and I a lovely box set of cards, each one depicting one of the mysteries of the Rosary. You may recall we are all in a monthly rosary group here in the city (Chicago). My most favorite card is for the Fifth Joyful Mystery of the Rosary – Finding the Child Jesus in the Temple. 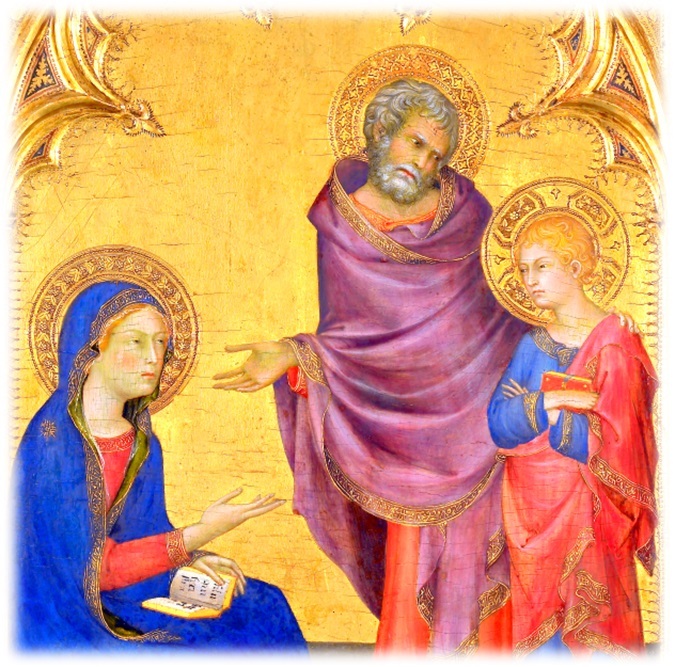 When I looked at the artwork of Simone Martini (1284-1344), I loved it! Nobody is happy in this picture! Mary’s not happy. Joseph’s not happy. Jesus is not happy. We have the benefit of knowledge of events before and after this time and can safely know there is still love. Not so much the love that feels good, although we can be sure there is some of that too, as part of the human experience, but the love both of parents for child and savior for the world. The love which sacrifices all for the explicit benefit of the beloved. Family life is NOT EASY. Kelly and I are about to embark on that journey (marriage, April 8, 2006) so many married saints (and I mean that most liberally in relation to the technical definition) have travelled before. To imagine there will not be crosses, is to deceive oneself. To mean and to say “Thy will be done! Thy Kingdom come!” is to trust, profoundly. As always, we ask for and are grateful for your prayers, your love, and your friendship. I loved this painting and, once again, thought I would tempt fate in sharing it with you.